EDB Recovery tool allows users to recover Exchange Server mailboxes from offline EDB & dismounted files. Apart from this, it also recovers the deleted data from Exchange Server mailboxes. 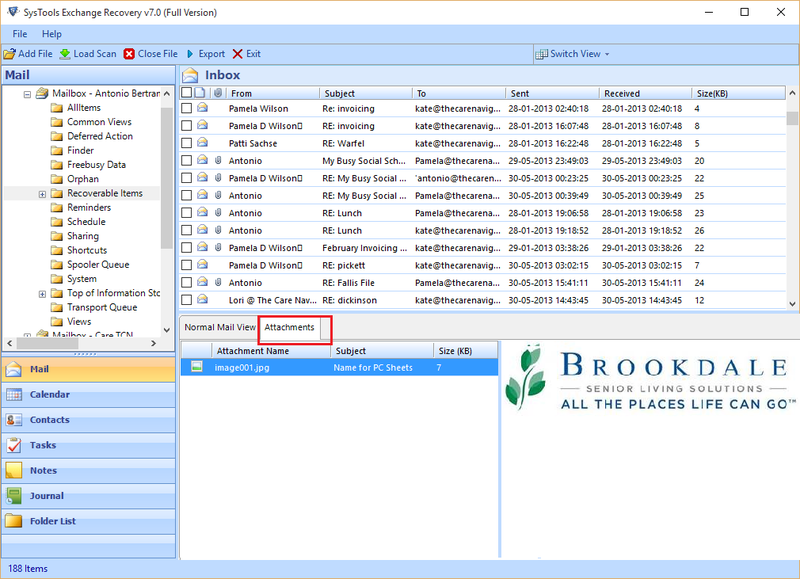 Users can recover emails, contacts, notes, calendars, notes, journals from each mailbox. The tool makes it possible for users to choose the EDB files of any storage group and retrieve all Exchange mailboxes in it. 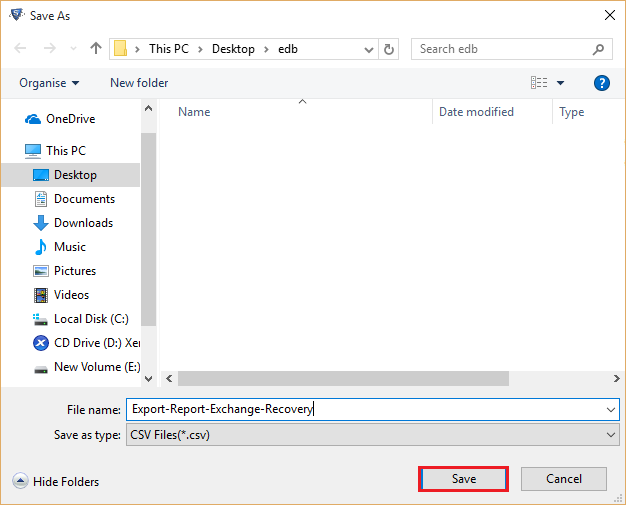 The Exchange EDB Recovery software supports numerous file types to export the recovered offline EDB database. 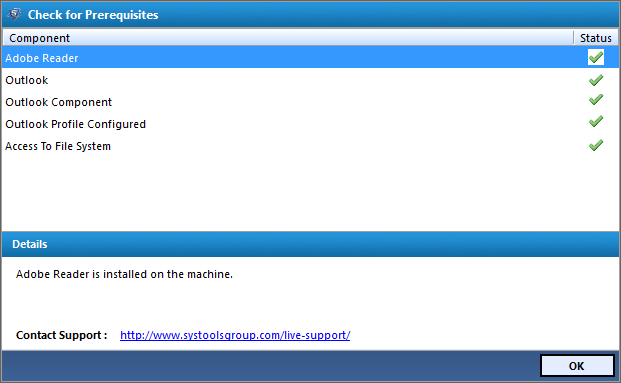 The tool provides the option to export the recovered data in PST, EML, MSG, HTML, and Portable Document Format files. It has the potential to restore all mail messages regardless of the type such as RTF format, plain text format, and HTML format. The original formatting remains intact. 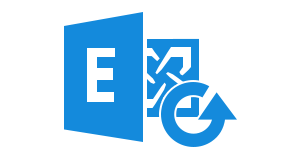 The exchange recovery software comes up with advance algorithms and allows repair and recover the entire database of Exchange. It can restore both public & private folders. The utility makes it feasible to retrieve Exchange priv.edb & Exchange pub.edb folders. It supports MS Exchange 2016/13 and allows users to export data in it and it is compatible with Exchange 2016, 2013 and all the below versions. 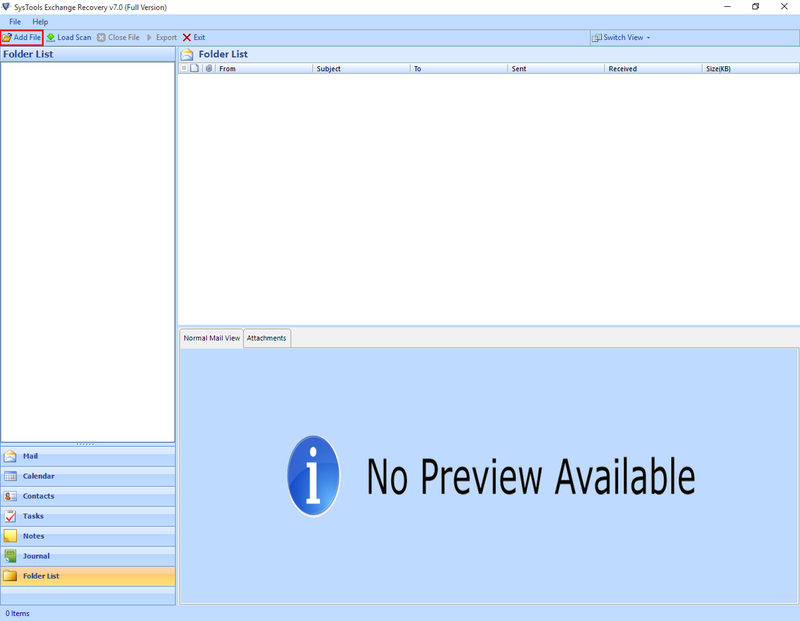 EDB Recovery tool produces a preview report instantly of all the mailboxes of Exchange Server. It includes the components such as emails, calendars, contacts, journals, tasks, etc. along with the Meta data. Users can create PST file from Exchange mailboxes once the data is recovered. The software can create UNICODE format PST & store all items such as contacts, calendars, tasks, emails, journals, etc, into it. 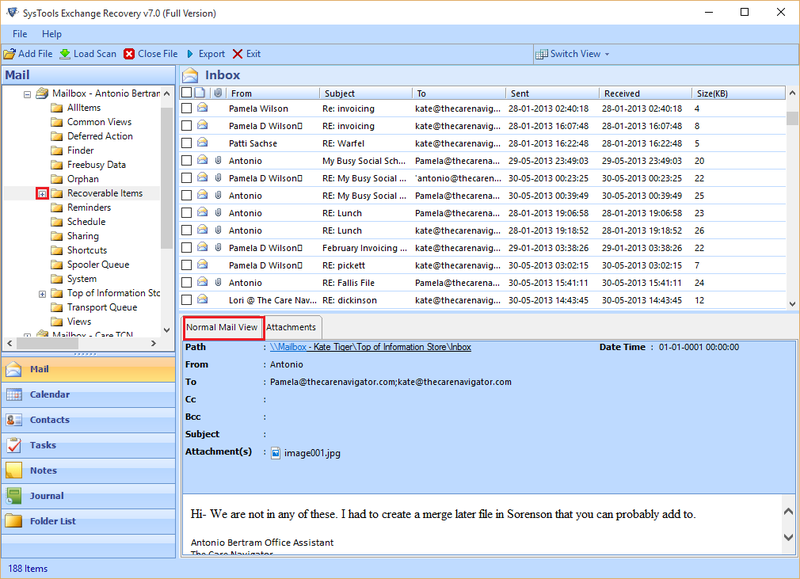 The EDB File Recovery Tool provides the option to export selective items from exchange mailbox to EML / PST / MSG formats. If users want to move EDB to EDB, then they need to provide a destination folder to perform the export. 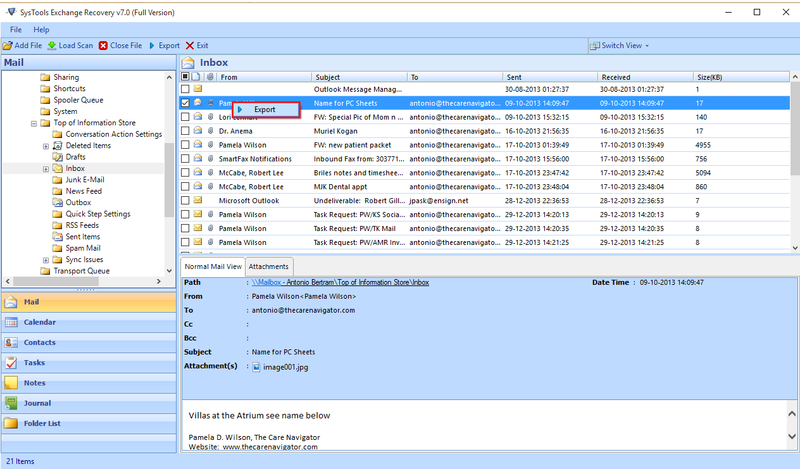 Users can also export selective Mailbox or folder. The tool is capable to move the retrieved data in bulk. There is also an option available to switch the screen while using the software. Can I repair highly corrupted files with EDB Recovery tool? Yes, you can easily repair and recover the corrupted EDB files without any bothering about the level of corruption. Is Exchange Server environment is required in the system to perform the recovery process of EDB files? Yes, Exchange Server installation is required to begin the process of recovery. 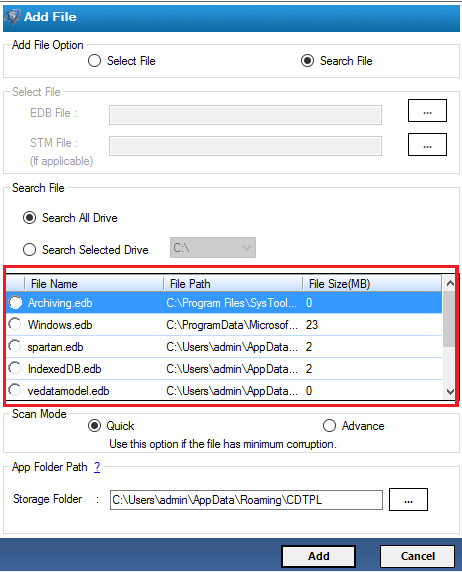 Does the tool recover the deleted EDB files apart from corrupted files? Yes, Exchange Recovery software is capable enough that it can restore the deleted EDB files as well. Is it possible with the software to repair public and private folder? Yes, the tool can recover both the public and private folder. Can I export the repaired data in MSG file format? 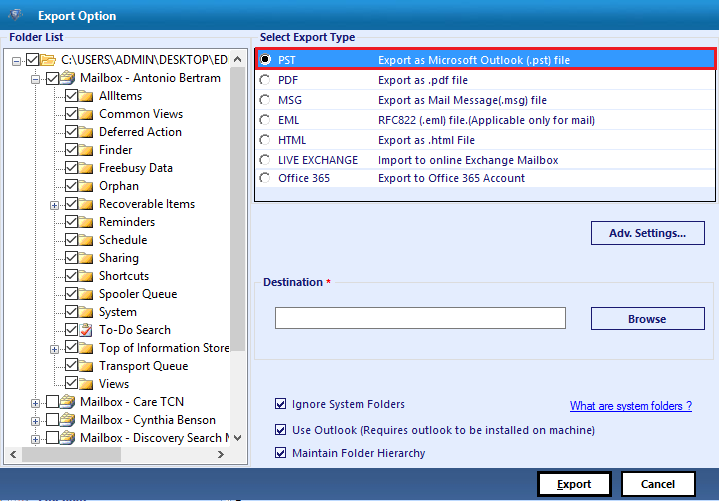 Yes, with MS Exchange EDB Recovery tool you can export the data in MSG format very easily. Firstly, run the software from the location where it is installed or go to Start >> All Programs >> Exchange Recovery and Click on OK.
Then, click on “Add File” option to choose single or multiple files of Exchange that you want to recover. 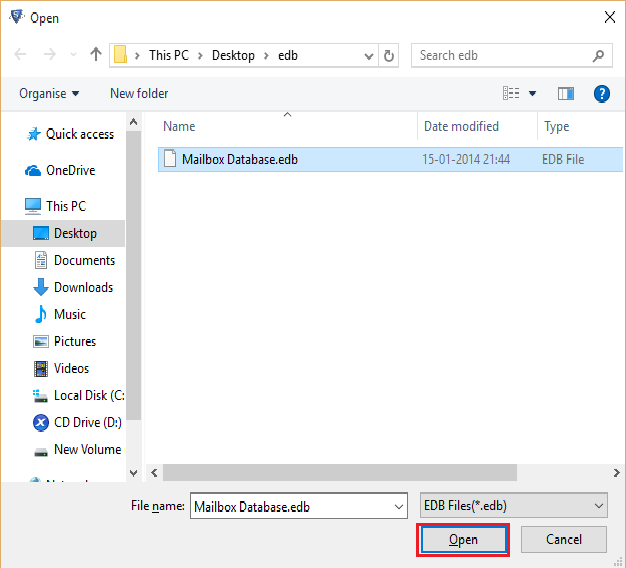 Now, click on the option of Open after selection exchange server edb file. 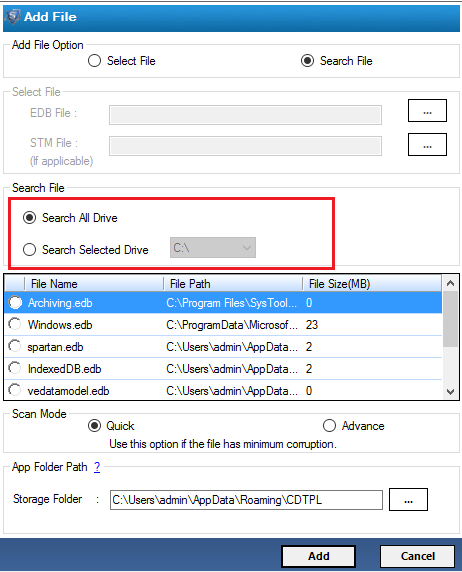 Search All Drive: Search .edb file from complete Drive. 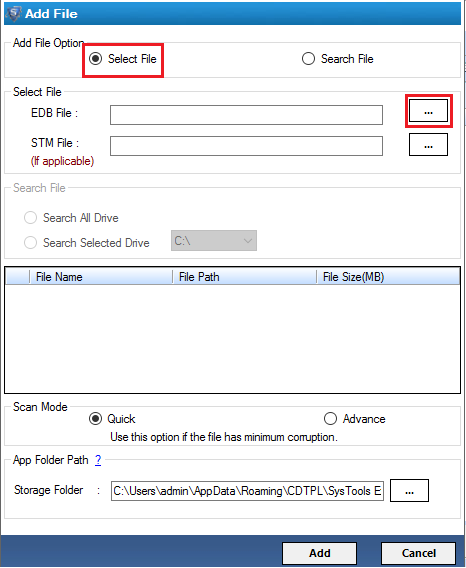 Search Selected Drive: Search file from chosen drive. There are two different options for scanning i.e. Quick (for faster recovery) & Advanced (for highly corrupted files) scanning. 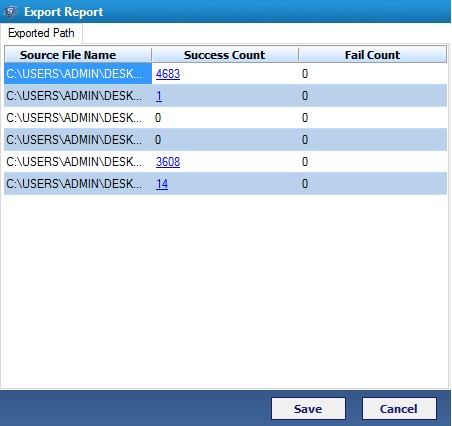 The tool shows the entire report of scanning process and as soon as process completed the tool confirms it via completion report. You need to save the scan file. Choose single or multiple emails and then make a right click to Export. Now select one resultant file format such as PST, HTML, MSG, EML, PDF, Live Exchange, & Office 365. Provide location to save exported file and click on Export button. "I was in a big trouble when Exchange Recovery Software comes as my savior. My EDB files were corrupted and I was in need to access those files in PST format. Then, while browsing I got this software and I used it without a second thought. Really, this is an amazing tool with a very simple interface." "EDB Recovery tool is simple tool to use. Any kind of user can access this utility for the retrieval of EDB mailboxes. One of the best things I liked about this software is that there is no file size limitation. You can recover any file regardless of its size. Thanks to the developers team for such a wonderful utility."